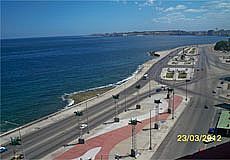 This is a condominium in 14th floor in front of the sea, with a wonderful 360 degree panoramic view of the entire city, the Havana seafront and especially the ancient and famous "Castillo del Morro" (Morro's Castle). 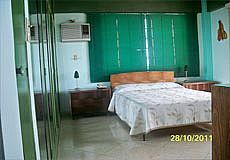 Located in the heart of Vedado, 2 blocks from the National Hotel of Cuba and a few blocks from the most centric restaurants, hotels, night clubs, banks, exchange offices and shopping centers. The rooms and the house have a maximum comfort and it's cleaning and brightness makes it unique. The rental price depending on the season of the year, the demand for rent and the type of room and it is from 35 CUC to 40 CUC. Book with us and you will get the best price available on the market for Pent House Orlando. Usually, payment must be in CUC upon arrival at the rantal place.